Since our inception, we’ve strived to operate our business in a responsible and sustainable manner. 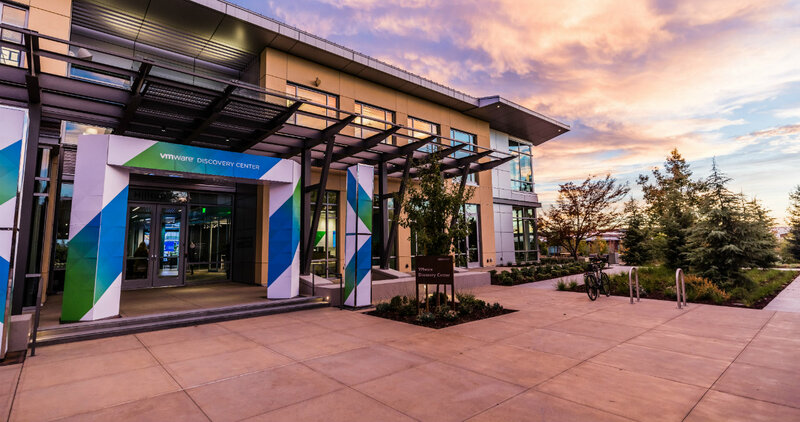 From our global commitment to green building practices, to the order of magnitude our technology delivers in terms of energy and carbon emission reductions in IT, VMware aims to leave ahead a better future by weaving sustainability into everything we do, including the opening of our new VMware Discovery Center. n opening day—Nov. 1, 2018—we hosted a multi-faceted, packed celebration of innovation focused on our global impact initiatives and vision for the future of Tech for Good. First, we announced a major milestone along our sustainability journey: We became a certified CarbonNeutral® company, in accordance with The CarbonNeutral Protocol, two years ahead of schedule. We established this goal in our Global Impact Report as part of our VMware 2020 Vision, and achieved it through a combination of energy-efficiency initiatives, renewable energy projects, and purchasing and delivering financing to low-carbon, sustainable development projects. This represents both a significant step toward fulfilling our commitment to long-term sustainability, as well as our commitment to accountability and transparency in managing our environmental footprint. To celebrate this vision of innovation and sustainability, we also had the honor of hosting Palo Alto Mayor Liz Kniss and Congresswoman Anna Eshoo, who spoke about the importance of public-private partnerships at the local, state, and federal levels to innovate ways for society to become more sustainable and resilient. This is no small feat, according to the U.N.’s latest report, as a society, we need to shift 70-85 percent of electricity to renewable energy sources by 2050 to avoid the worst impacts of climate change. Given this urgency, we believe we must collaborate across government, industry, and community to innovate and find solutions to mitigate and adapt to this global challenge. Buildings account for 39 percent of CO2 emissions in the United States. Mostly it’s the result of heating, cooling, and lighting, in addition to the appliances and electrical equipment we must plug in. That’s why innovation in green building can play a major role in reducing the impact of climate change, and it’s why we have a long-standing commitment to sustainable buildings. VMware currently has 12 LEED® certified buildings including two LEED® Platinum certifications—one at our office in Bangalore, India, and one at our data center in Washington state. Our new Visitor Discovery Center at our headquarters in Palo Alto was designed to LEED® Platinum standards and provides an innovative, sustainable space for collaboration and inspiration with our customers, employees, and community. With a magnificent view over Silicon Valley, the new Discovery Center features Forest Stewardship Council certified wood wherever possible, and the wood and metal ceiling treatments were manufactured with 63 percent pre-consumer recycled content. The carpeting is Green Label Plus certified and features low-VOC materials throughout the building. We added more charging stations to our already sizeable electric vehicle charging infrastructure, which now includes 78 ports across our campus and we dedicated 15 new priority parking spots for carpool and clean air vehicles. In striving for leadership in environmental design, we also prioritized energy efficiency and onsite renewable energy. Not only does our new Discovery Center source approximately 20 percent of its power from rooftop solar panels, but also we are connecting this onsite renewable energy with other solar power across the campus to create a community microgrid. The highly digital modern world of the future will require not only a clean grid, but also a reliable and resilient one. Renewable energy resources—like wind and solar—are variable, which means they are not consistent and shift up and down depending on weather conditions. Integrating renewables into the grid while maintaining reliability means coming up with new and innovative ways to balance and secure the grid. That’s why we believe innovation and partnership on projects like a microgrid is a smart thing to do. Beginning as a proof of concept, the microgrid will serve as a testbed to control distributed energy resources and integrate local renewable energy in order to maintain resilience at the corporate and community level. And because we believe resilience is sustainability’s twin, we are partnering with the City of Palo Alto to also explore the potential use of the microgrid to augment the community’s emergency services by providing a charging site for the City’s emergency command vehicles, and an emergency communications node that can be used during major emergencies that cause extended power outages and fuel shortages. Getting this proof-of-concept off the ground is just another example of our belief in exponential innovation that shifts the needle on our sustainability journey. To wrap up our Discovery Center opening celebration, and build on our long-standing commitment to innovation, we also engaged some of the brightest minds to explore the topic of “Innovating for Good–The Opportunity and Responsibility for Tech.” Recognizing the important synergies between the Fourth Industrial Revolution and accelerating progress on the U.N.’s Sustainable Development Goals (SDGs), we believe the tech sector has a major role to play specifically in Goal #9: Industries, Innovation, and Infrastructure. Jonathan Reichental, chief information officer of the City of Palo Alto, shared the promise of mobile to provide auxiliary medical professionals to remote areas. 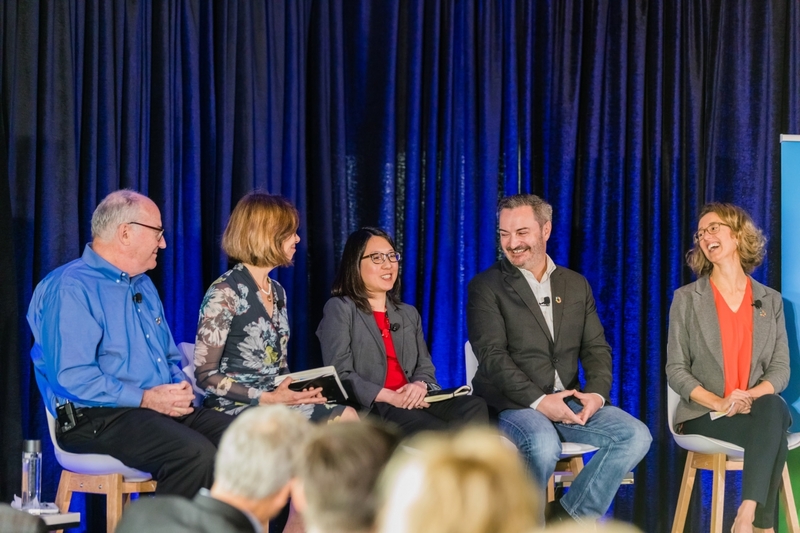 Victoria E. Lee, project lead of Fourth Industrial Revolution for the Earth for World Economic Forum, discussed the intersection of technology with the 17 SDGs, including innovations in food, water, energy, and access for all to the internet. Debra Dunn, co-founder of Stanford University’s FEED Collaborative, shared several examples of how technology innovation helps solve complicated problems like human trafficking through data mining and management. Bob Sutton, Stanford professor and author, cautioned technology companies to take the time to spread excellence and not rush to a solution. The opening celebration of our Discovery Center gave us an opportunity to bring members of our community together to discuss and imagine what we can do collectively to prioritize sustainability and resiliency for people and the planet. For our part, we will continue to participate in this critical conversation. As we chart our path forward, we are more committed than ever to be intentional, and to do what we can to leave ahead a better future—putting back more than we take—and to inspire our employees, customers, and partners to do the same.